Navigate to the project’s Audio settings (main menu: Edit > Project Settings, then select the Audio category). Select an ambisonic decoder from the list of available decoders in the project. 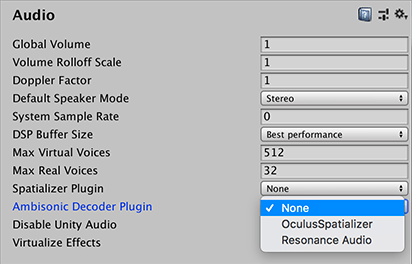 There are no built-in decoders that ship with Unity 2017.1, but Google and Oculus each provide one in their audio SDKs for Unity. There are two changes to AudioPluginInterface.h for ambisonic audio decoders. First, there is a new effect definition flag: UnityAudioEffectDefinitionFlags_IsAmbisonicDecoder. Ambisonic decoders should set this flag in the definition bit-field of the effect. During the plugin scanning phase, this flag notifies Unity that this effect is an ambisonic decoder and it will then show up as an option in the Audio settings’s list of ambisonic decoders.